Trade talks with China came and went again this week without any notable progress, at least in the respective statements from both parties. But the behavior of the Chinese currency tells a different story. Remember, China controls the value of its currency. They “fix” it every day. And they’ve been walking it higher. That’s a big signal. This chart shows the dollar/yuan exchange rate. When the orange line is rising the dollar is strengthening, the yuan is weakening – and vice-versa. You can see in 2015 and through 2016 (Line 1) the Chinese devalued the yuan by about 16% to respond to weak exports and sluggish growth. When Trump was elected, he made it clear he would be coming after China for their cheap currency policies (i.e. manipulating the yuan to retain dominance in global exports). With that, the Chinese strengthened the yuan in effort to stave off a trade war. It didn’t work. And you can see in the most recent run up (Line 3) how they’ve responded. They’ve gone back to weakening the currency. Now, as we’ve discussed, the lower stock market has put pressure on the Trump agenda, which makes it more likely that some ground will be given on the demands that the U.S. has made on China. So, with this backdrop in mind, how can Trump get to a deal on trade that gives him a win — and gives China an out, for the moment? 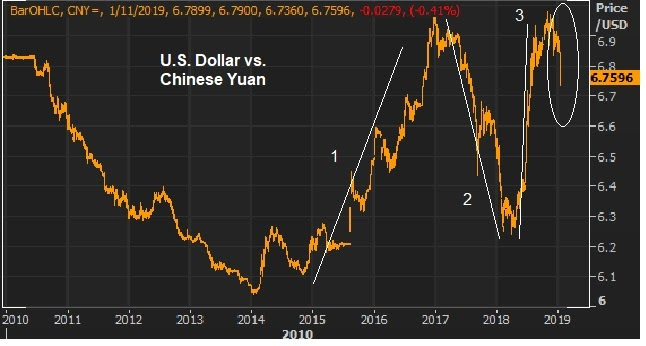 The Chinese currency could be a tool to get to an agreement – maybe China taking it back to 6 yuan per dollar in the near term. 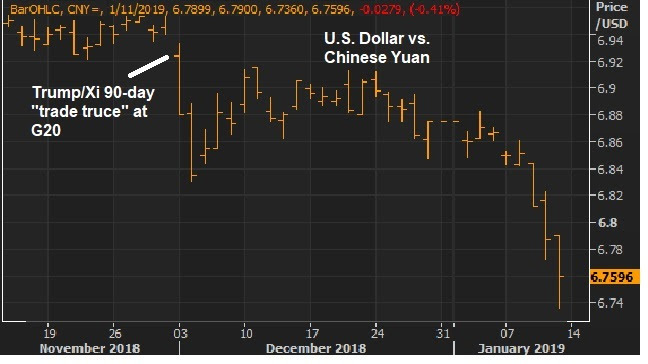 You can see in the shorter-term chart above, since Trump and Xi agreed to a 90-day period to get a deal done, the Chinese have been walking the yuan higher (which is shown in the falling line in the chart).